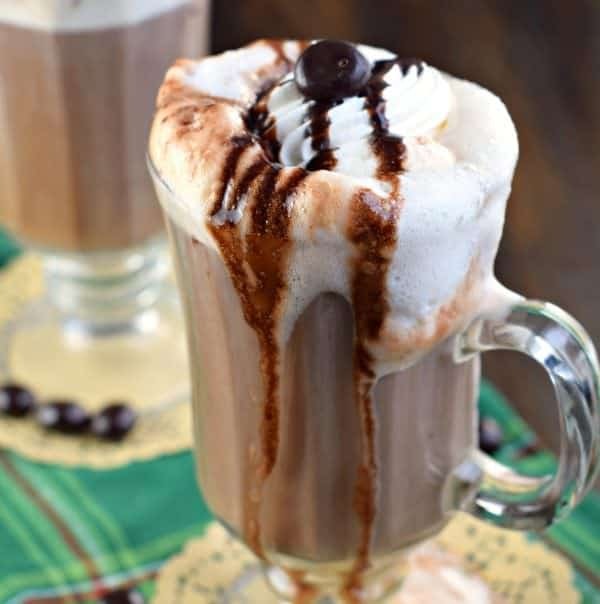 Do you love a hot, creamy Mocha Latte? Well, guess what? You can now make them at home, with no espresso machine needed!!! So I’m hoping all of you regular Shugary Sweets followers know about my obsession with coffee? Yes? If not, let me fill you newbies in a secret: I LOVE COFFEE!!!! Not only the flavor of coffee, but I love the ritual of coffee making. From picking out my mug (I have a collection of assorted mugs, no two are the same), to smelling the aroma of the coffee as it brews…to adding in my favorite flavor creamer. Another thing I love? 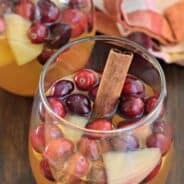 Recreating coffee house drinks at home. 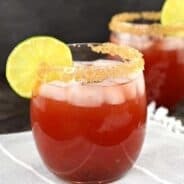 Because I don’t know about you, but I do NOT want to pay $6 for a drink that I can make at home, easily. My Mocha Latte recipe requires ZERO special equipment. 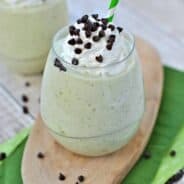 I use a mason jar and lid and SHAKE SHAKE SHAKE. If you have an aerator that you can froth your milk, that works (I have this handheld one). But, seriously, just a mason jar works too! Start with double strength coffee. I brew my coffee extra strong when I know I’m going to be making a latte. You’ll dial down the coffee flavor as soon as you add the milk, so you want to be sure that your coffee is strong enough to taste! You can also make espresso if you prefer. Heat your milk in a jar for THREE, 30 second intervals in the microwave. After each 30 seconds, put a lid on your jar and shake it. Be careful though, the jar gets hot! 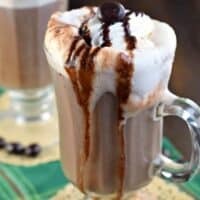 Use any type of hot cocoa mix for making the mocha. There are some great “flavored” cocoas that would be yummy (salted caramel anyone??). Add it to your coffee mug before the coffee. Give it a good stir with the hot coffee before adding your frothy milk! 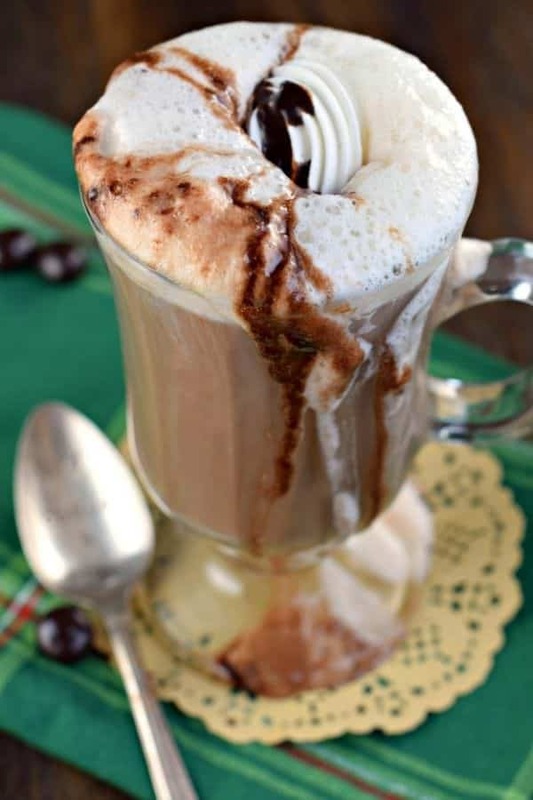 Go the extra mile and add some whipped cream and chocolate syrup. I mean, it is the holidays, and you know you want to do it! ENJOY!! You know what I love about the holidays (besides Mocha Lattes)? I love working with the American Dairy Association, Mideast. Every year they partner with Feeding America (the largest hunger relief and food rescue organization in the United States)to raise money for MILK! Through generosity of donors across the country, The Great American Milk Drive turns online donations into gallons of milk for families in your local community. Did you know that milk is the MOST requested item at food pantries, but the LEAST donated? HOW CAN YOU HELP? (I’m glad you asked, haha)!! You can donate online directly to The Great American Milk Drive! You can also learn more about how this program works! You can follow (LIKE) the American Dairy Association facebook page, twitter page, or Instagram page. For every NEW LIKE to those platforms, the ADA, Mideast will donate 25 cents to the Great American Milk Drive! Finally, you can join me on Twitter, on Tuesday, December 6, 2016 from 9-10pm EST. 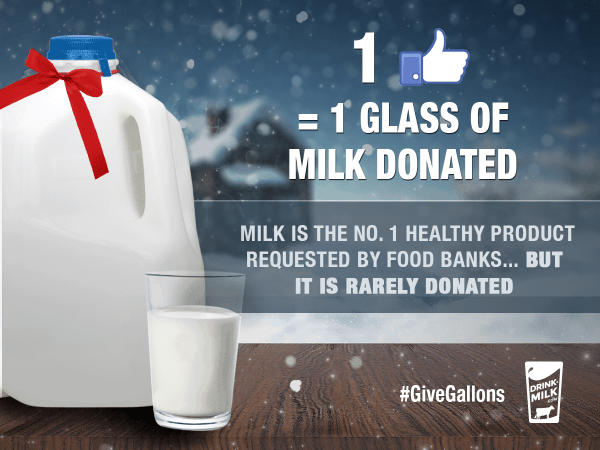 Everyone who attends the #GiveGallons party, 25 cents will be donated to Feeding America’s Great American Milk Drive. Each 25 cent donation is equivalent to ONE GLASS of milk! What an easy way to give back! Brew 2 cups of strong coffee (double strength or espresso). In a mason jar, or glass pitcher, heat milk in the microwave for 30 seconds. If using the mason jar technique, screw lid on tight and shake jar vigorously for a minuteuntil frothy. Repeat for a total of 3 times (90 seconds of heating). To serve: Add 2 Tbsp hot cocoa mix to two mugs. Pour hot coffee into mugs, and stir until hot cocoa is blended. Slowly pour frothy milk over coffee. 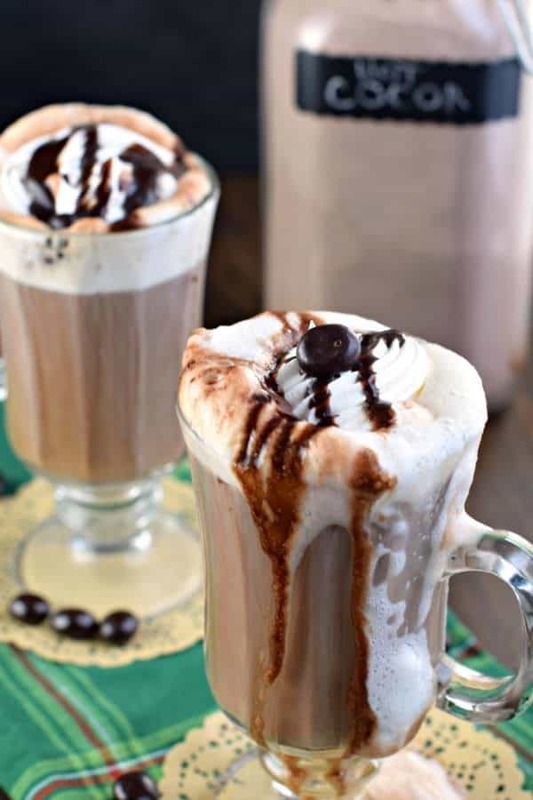 Add whipped cream and chocolate syrup, if desired (highly encouraged)!! **This is a sponsored post on behalf of the American Dairy Association, Mideast. I was compensated for my time, however all opinions expressed are 100% my own! 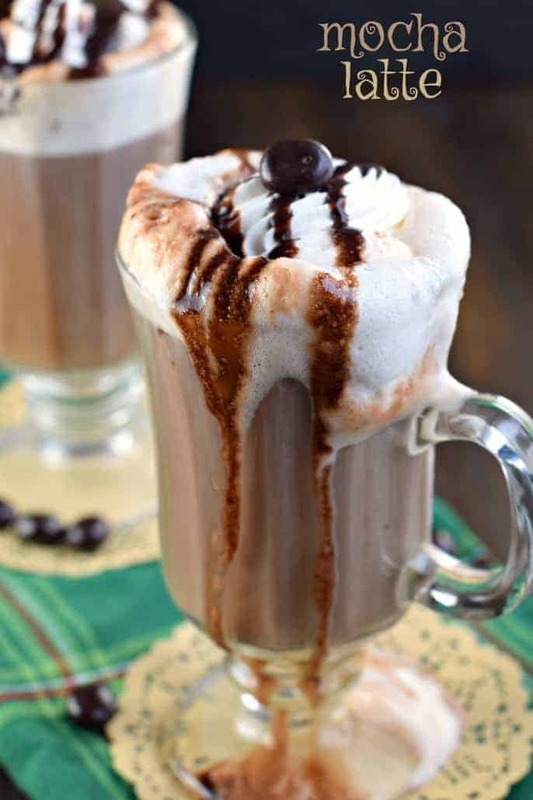 I love making lattes at home and this one looks especially indulgent and delicious! Also, your Grinch Drink just popped up and I’m loving it!! Such a great cause! These lattes are calling my name, Aimee! This SO beats what I normally have in the morning! Love it! Ever since I moved to Portland I’ve been enjoying warm drinks more and more. Adding this my list! Why is it that coffee is sooooo delicious with sweet things?